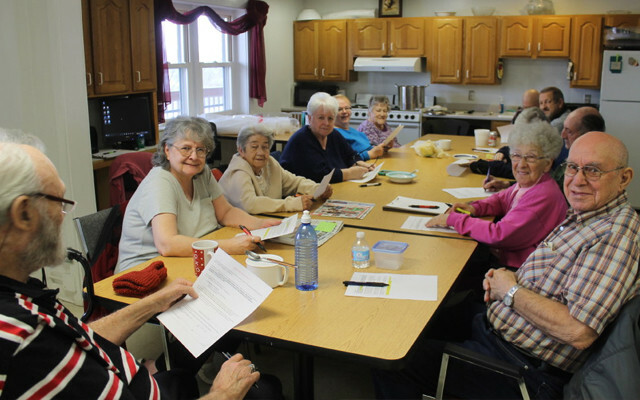 Members of the Highview Apartments residents group in Madawaska discussed upcoming holiday celebration plans at their monthly meeting, Wednesday. MADAWASKA, Maine — Members of the Highview Apartments residents group in Madawaska discussed upcoming holiday celebration plans at their monthly meeting, Wednesday, Nov. 30. Final details of the residents’ Christmas party on Dec. 21 were not yet finalized; however, the residents will start the holiday season off with a musical performance by The Cyr family on Dec. 20. Resident Judy Bailey, who recently moved back to area following 30 years living in the Bangor area, said she planned on being one of Santa’s helpers at the holiday party. “With a short, short skirt, and pom poms,” she said with a laugh at the lunch meeting.